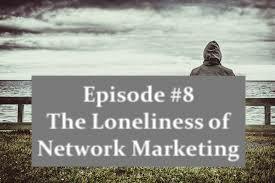 T he loneliness of Network Marketing is a real problem when starting your Network Marketing career. Without a doubt I feel that Network Marketing is one of the best professions to get involved with. The ability to start a business that can go global with a minimum investment with training already in place is very powerful. However the business is built on momentum, if you have good momentum, your business can take on a life of its own but if you have poor momentum it can be one of the most loneliest places to be. To avoid the loneliness of Network Marketing, you have to make sure you have a full pipeline of prospects. The more prospects you are speaking to is the more posture you have and the better you communicate. The worst thing is having a good message to tell but nobody to tell it to. This is why lead generation is such an important activity because if you can generate leads you will always have a full pipeline. Unfortunately Network Marketing companies do not teach how to generate leads, they just teach how to market their product or service. For this reason many people experiencing the loneliness of Network Marketing simply because they have nobody to speak to. Learning Lead Generation is so important to the success of any Network Marketer, this is why platforms that teach this specifically for Network Marketeers are so valuable. Unfortunately many people cannot be bothered to learn the skill, so they continue to do things they've always done and never get the results they always wanted. It is time to wake up if this is your experience, so you can get to the levels you always wanted to get to. Remember it does not matter how good your product or services is, it is how many people you can expose them too. If this post has helped you, please feel free to share it with anyone you feel would benefit from it. PS, if you want to see platform that I personally use that allowed me to generate over 120 leads in 48 hours, just click HERE! What Is Your Approach To Automation?